One of the things I love about NYC is there is so much culture! If you are looking for ethnic cuisine, the possibilities are practically endless! My dear friend Nina and I have tried out raw, Indian and Middle Eastern food. Last week we ventured out to find some good Korean BBQ. There are many places in the city to try this out, but there was no other place than Korea-town to satisfy us. Korea-town, located on 32nd St. between 5th and 6th avenues has all things Korean, even a full on Korean grocery store. Although there were many places in Korea town to try Korean BBQ, Nina and I decided to go to Hangang. The atmosphere was beautiful and relaxing and the service was wonderful as well. We were greeted and seated and then immersed ourselves in the menu. Nina and I, both being health conscience, opted for the lean bulgogi beef and chicken BBQ. We also ordered a side of shrimp shumai. Little did we know we ordered too much! 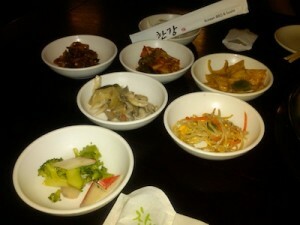 Once our order was placed, our waiter quickly brought out six little dishes of appetizers, ranging from kimchi to tofu. As we were indulging on our delicious appetizers and great conversation our protein came out. The waiter quickly took the beef and placed it on the grill, quickly turning the meat when needed. Within a few minutes we were eating deliciously seasoned grill beef. 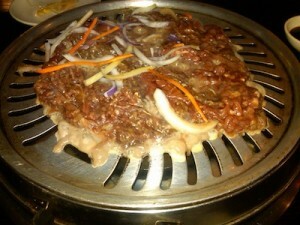 Bulgogi is usually marinated in garlic, soy sauce, sugar, honey, and fruit juice and sesame oil. You could definitely taste the light sweetness of the marinade. As soon as we finished our bulgogi, our waiter quickly changed our grill plate and started on the chicken. Within a few minutes our chicken was being grilled to perfection. Soon, we were indulging in moist, tender, marinated pieces of chicken breast. The chicken was delicious, but I did find the bulgogi tastier. As our meal was coming to an end, we were given wedges of orange which was the perfect end to this meal! The light citrus cleansed our palettes, letting us enjoy our Red Mango! Hangang is definitely a place I would go to again. If you are interested in good Korean BBQ and happen to be in the area, please do check this out. This entry was posted on Wednesday, March 23rd, 2011 at 9:59 am and is filed under Food, Tasting the World in NYC, Woman About Town.